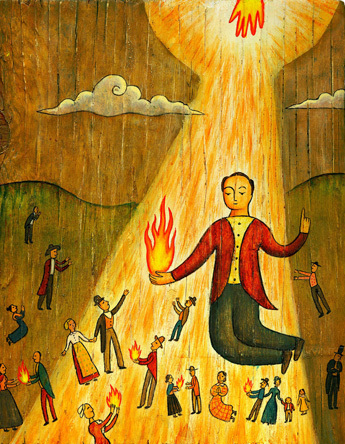 Joseph Smith’s doctrine of an accessible, caring God illuminated the religious landscape and caught fire in the hearts of the early Saints. A scant dozen years before Joseph Smith’s birth, Louis the XVI was guillotined by radicals. That may seem an odd counterpoint to a talk about the Mormon Prophet, but Albert Camus called that execution the “the crux of our contemporary history.”1 Why? Because it represented a banishment of God from the subsequent history of that people and because it precipitated a steep decline in the fortunes of religion in the West generally. Louis was, after all, supposed to be God’s representative by divine right. His premeditated execution represented a deliberate, willful repudiation of God and His role in civic society. The revolutions that occupied America and Europe from 1776 and throughout the next century were occasioned by many factors. Central elements were irrepressible optimism about human potential and a growing embrace of human dignity and freedom as the birthright of every man. Lafayette called his violent passion for liberty a “holy madness.”2 Jefferson swore on the altar of God eternal enmity against every form of tyranny over the mind of man. The great William Wordsworth spoke for millions when he wrote, “Bliss was it in that dawn [of revolution] to be alive, / But to be young was very heaven!”3 But as the philosophers, the French revolutionaries, English radicals, and growing numbers of intellectuals and reflective individuals concluded, dignity and freedom alike were threatened by institutionalized systems of religion that almost universally emphasized human depravity, inherent guilt, and arbitrary omnipotence. The wrath of God is like great waters that are dammed for the present. . . . The God that holds you over the pit of hell, much as one holds a spider, or some loathsome insect over the fire, abhors you. The presence of God was so near, and so real, that I seemed scarcely conscious of any thing else. God the Father, and the Lord Jesus Christ, seemed as distinct persons, both manifesting their inconceivable loveliness, and mildness, and gentleness, and their great and immutable love to me. . . .
Long before Joseph Smith offered his first prayer, thousands and millions of people must have yearned, as Sarah did, for the assurance that God was not the severe, distant, impersonal deity of Jonathan Edwards, but the kind, loving, and very personal God that Joseph found in the Sacred Grove. That Joseph experienced this God, that the Book of Mormon testified of and exemplified his tender mercies (see 1 Ne. 1:20), and that all and sundry were invited and given the means to experience God’s presence in the world and in their own lives made this belief in a living, personal God a potent and irresistible principle. That God has a body of flesh and bones is not the revolutionary teaching. God’s physical form is not the point. That God has a heart that beats in sympathy with ours is the truth that catalyzes millions—that he feels real sorrow, rejoices with real gladness, and weeps real tears. This, as Enoch learned, is an awful, terrible, yet infinitely comforting truth (see Moses 7). Two characteristics distinguish the revelation Joseph modeled. First, from his initial inquiry in those New York woods to his last revelations, Joseph’s prayers anticipated a personal response, a discernible moment of dialogue or communicated content. This model, which I call dialogic revelation, situates Joseph and the religion he founded well outside Christian understandings of revelation. Even the Christian model that seems closest in spirit to this one, called by Avery Dulles “revelation as inner experience,”11 differs sharply. Within this model, theologian George Tyrrell writes that there can be no revealed statements or doctrines.12 Against this backdrop, Joseph insisted that prayer frequently and dramatically evokes an answer that is impossible to mistake as anything other than an individualized, dialogic response to a highly particularized question. That God has a body of flesh and bones is not the revolutionary teaching. God’s physical form is not the point. That God has a heart that beats in sympathy with ours is the truth that catalyzes millions—that he feels real sorrow, rejoices with real gladness, and weeps real tears. Second, the Book of Mormon expands the notion of revelation far beyond the Old Testament model, according to which, as the Oxford Dictionary of the Christian Church puts it, “[prophecy] was preeminently the privilege of the prophets.”13 This rupture with Judaeo-Christian precedent occurs most forcefully in 1 Ne. 10–11. Lehi is the patriarch and prophet of his people. So it is only to be expected that when a vision of the tree of life is given, Lehi would be the recipient. But then Nephi approaches the Lord in prayer, asking that he also “might see, and hear, and know of these things” for himself (1 Ne. 10:17). The Spirit of the Lord appears to him, and Nephi makes his wish known. The Spirit then asks him if he believes the words of his father. I don’t know this, but I can imagine that at this moment Nephi pauses. Perhaps if he says no, the Spirit will rebuke him for disloyalty and faithlessness. But if he says yes, the Spirit might well ask, “Then why not be content to take the word of your prophet and patriarch?” When Nephi indicates that he does indeed believe the words of his father, the Spirit breaks forth into a virtual psalm of rejoicing, shouting, “Hosanna” (1 Ne. 11:6). Then Nephi is rewarded, not rebuked, for seeking his own personal revelatory experience. And here we find a dramatic and momentous break with the Old Testament pattern. Revelation, we here learn, is the province of Everyman. Another aspect of Joseph’s legacy that shapes the special character of the people who call him “Prophet” and connects them in a particularly powerful way is the possibility of religious certainty that Joseph held out. A man inducted into his religious vocation with a literal visit by an embodied God and Christ is not likely to view his religious convictions in the same terms as a typical Christian believer. Translating scripture out of tangible metal plates weighing 40 or 50 pounds is not of the same order of prophetic utterance as expressing mere spiritual intimations. Feeling the weight of angelic hands belonging to resurrected Apostles on his head, conferring upon him the priesthood of God, produced a crystalline certainty about his authority. Joseph Smith, in other words, did not simply believe he was a prophet inspired to act in God’s name. In his mind he was as certain as any man could be on any subject sacred or secular. “I knew it, and I knew that God knew it,” he said of his initial encounter with deity (JS–H 1:25). Joseph’s formative experiences, both as a 14-year-old seeker and as a prophet and religion maker, were saturated in the physical, the tangible, the material, and the visible. Joseph apparently believed that the personal epiphany he experienced in his visitation by the Father and the Son—heralding full immersion in the divine light, with all its epistemological fulness and certainty—betokened an order of knowledge that was the right and destiny of all faithful Saints. That very real possibility informs Mormon life, worship, personal aspirations, and shared purpose. To attend any Latter-day Saint testimony meeting, for example, is to enter into a rhetorical universe in which a language of calm assurance and confident conviction, even professions of certain knowledge, overwhelm the more traditional Christian expressions of common belief. It may well be that this sense of shared knowledge, its possession or pursuit, is an even more potent community builder than shared faith. At the same time, of course, such rhetoric can have its drawbacks. It can convey a sense of smugness or superiority; it can create the tragic impression that with certainty there is no room or need for searching; and it can create discomfort and alienation on the part of those who do not or cannot share in expressions of serene, unconflicted conviction. I want to conclude with a few observations about what happens in the absence of such certainty. Whether faith is a way station on the path to certainty, as it seems to be in Alma’s sermon (see Alma 32), or the place one’s spiritual journey takes one to, it is important to understand the incalculable significance of faith—of this deliberate gesture of belief—as a defining moral gesture. We are always provided with sufficient materials out of which to fashion a life of credible conviction or dismissive denial. What we choose to embrace, to be responsive to, is the purest reflection of who we are and what we love. Some people seem born with faith. And many people die with a full complement. My own grandmother spent her last months pining for death because she was the last of her generation, she “missed her people” to an excruciating degree, and she grew more and more disconnected from a world she saw as simply irrelevant. Faith did not seem a choice for her. It descended upon her as naturally and irresistibly and encompassingly as the heavy snowfalls on her upstate New York farm. But such a gift I have not found to be common. And it would seem that among those who are committed to the scholarly pursuit of knowledge and rational inquiry, faith is as often a casualty as it is a product. The call to faith is a summons to engage the heart, to attune it to resonate in sympathy with principles and values and ideals that we devoutly hope are true and have reasonable, but not certain, grounds for believing to be true. I am convinced that there must be grounds for doubt as well as belief in order to render the choice more truly a choice, and, therefore, the more deliberate and laden with personal vulnerability and investment. The option to believe must appear on one’s personal horizon like the fruit of paradise, perched precariously between sets of demands held in dynamic tension. We are, it would seem, always provided with sufficient materials out of which to fashion a life of credible conviction or dismissive denial. We are acted upon, in other words, by appeals to our personal values, our yearnings, our fears, our appetites, and our ego. What we choose to embrace, to be responsive to, is the purest reflection of who we are and what we love. That is why faith, the choice to believe, is in the final analysis an action that is positively laden with moral significance. Men and women are confronted with a world in which there are appealing arguments for God as a childish projection, for modern prophets as scheming or deluded imposters, and for modern scriptures as so much fabulous fiction. But there is also compelling evidence that a glorious divinity presides over the cosmos, that God calls and anoints prophets, and that his word and will are made manifest through a sacred canon that is never definitively closed. There is something to tip the scale, however. There is something to predispose us to a life of faith or a life of unbelief. There is a heart that in these conditions of equilibrium and balance—and only in these conditions of equilibrium and balance, equally “enticed by the one or the other” (2 Ne. 2:16)—is truly free to choose belief or cynicism, faith or faithlessness. Why, then, is there more merit obtained—given this perfect balance—in believing in the Christ (and his gospel and prophets) than believing in a false deity or in nothing at all? Perhaps because there is nothing in the universe more perfectly good, absolutely beautiful, and worthy of adoration and emulation than this Christ. And a gesture of belief in that direction, a will manifesting itself as a desire to acknowledge his virtues as the paramount qualities of a divided universe, is a response to the best in us, the best and noblest of which the human soul is capable. 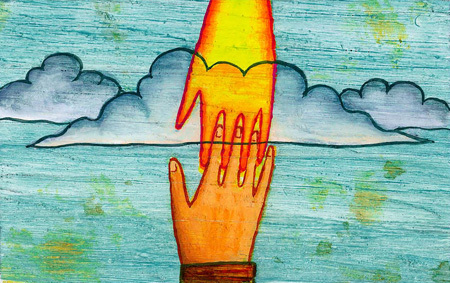 For we do indeed create gods after our own image—or potential image. And that is an activity endowed with incalculable moral significance. 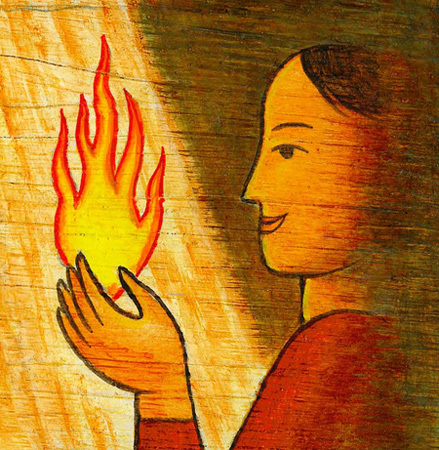 Joseph Smith ignited something in thousands of men and women that connects them to God and to each other in powerful ways. In part, this was because he was, like Esther, born to his hour in human history, an hour when the passion for human liberty never burned brighter. His message resonated because it was a stirring and compelling and exciting synthesis that presented a spiritually hungry humankind with a god who was not a threat to human potential but a being who gloried in that potential and whose work was to bring it to fruition. That was why Joseph’s message resonated and caught hold like a burning fire. But his message also flamed forth because millions of men and women have freely chosen to believe. They assayed the opinions of doubters, and they gave a hearing to the critics. Like Brigham Young, they knew Joseph was human and subject to err, but they sampled his words and agreed they tasted like honey. They weighed the beauty of a God and of human origins and of a human future unlike anything before imagined. They found reason to doubt, and they found reason to believe. They chose to believe. 1. Albert Camus, “The Execution of the King,” in part III of The Rebel: An Essay on Man in Revolt, trans. Anthony Bower (New York: Vintage Books, 1991), p. 120; see also Adam Zamoyski, Holy Madness: Romantics, Patriots, and Revolutionaries, 1776–1871 (New York: Viking, 2000), p. 1. 2. Marquis de Lafayette, Lettres de Prison, ed. Jules Thomas (Paris: Delagrave, 1907), pp. 203–5; quoted in Zamoyski, Holy Madness, p. 88. 3. William Wordsworth, The Prelude (1799–1805), book 11, lines 108–9. 4. William Wordsworth, The Excursion (1814), book 4, lines 330–31. 5. Alexis de Tocqueville, Democracy in America (Chicago: University of Chicago Press, 2000), p. 282. 6. Thomas Carlyle, “The Hero as Prophet,” Heroes and Hero Worship (1840). 7. Jonathan Edwards, “Sinners in the Hands of an Angry God,” The Works of President Edwards: With a Memoir of His Life, ed. Sereno Edwards Dwight (New York: Carvill, 1830), vol. 7, pp. 169, 170, 172. 8. Sarah Edwards, in Works of President Edwards, vol. 1, pp. 172–73; italics in original; see also George M. Marsden, Jonathan Edwards: A Life (New Haven, Connecticut: Yale University Press, 2003), pp. 243–44. 9. Parley P. Pratt, “Joe Smith and the Devil: A Dialogue,” New York Herald, Aug. 25, 1844, p. 1. 10. Gertrude Himmelfarb, The Roads to Modernity: The British, French, and American Enlightenments (New York: Knopf, 2004), p. 48. City, New York: Doubleday, 1983), p. 68. 12. See George Tyrrell, Through Scylla and Charybdis (London: Longmans, Green, 1907), pp. 326–27. 13. In F. L. Cross and E. A. Livingstone, eds., The Oxford Dictionary of the Christian Church, 3rd ed., rev. (Oxford: Oxford University Press, 2005), s.v. “prophecy,” p. 1,345. 14. Abraham J. Heschel, The Prophets (New York: Harper and Row, 1969–71), vol. 2, p. xvi; emphasis in original. 15. Joseph Smith, History of The Church of Jesus Christ of Latter-day Saints, ed. B. H. Roberts (Salt Lake City: The Church of Jesus Christ of Latter-day Saints, 1932–51), vol. 3, p. 381. Terryl Givens is a professor of literature and religion and the James A. Bostwick chair of English at the University of Richmond. He is author of two Oxford-published books: Viper on the Hearth: Mormons, Myths, and the Construction of Heresy and By the Hand of Mormon: The American Scripture That Launched a New World Religion. This article is a condensed version of his Nov. 29, 2005, forum address at BYU. The full text of this forum address was printed in the most recent issue of BYU Studies (45:1) and can be accessed at byustudies.byu.edu. Send comments on this article to magazine@byu.edu.